A deep crimson dye is extracted from the female cochineal insects. Cochineal produces a range of scarlet, pink and other red hues from the dye found in cochineal insects, carminic acid. 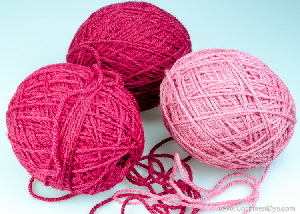 Cochineal looks a little more expensive than some natural dyes but 25 grams of whole cochineal bugs will dye a pound (450 grams) of wool a good red, and another pound or two in shades of pink. In fact a cochineal dye bath is difficult to exhaust and can be used to produce a range of colours in successive batches. Expect to be able to use the same dye bath for 4-6 batches of wool.